I stayed up way too late last night stitching Lizzie Kate's "Christmas is Forever." I'm loving this one! I love the colors - they are so bright and pretty! I had some leftover bananas so I thought I would make some banana muffins today. I got the recipe from my mom and they are so good! Preheat oven to 425, spray muffin pan with cooking spray. mix wet ingredients in one bowl and dry in another. Make a well in dry ingredients, dump wet into the well. Mix well. Bake for 15 min - until top is firm. I sprinkled some walnuts on top of a few of them for me (my kids don't like nuts). Hope you all have a Happy Thanksgiving tomorrow. We are staying home having a very small dinner. Actually I haven't even gone shopping yet (that's pretty sad). Write later! Great progress on L*K!! It's such a pretty stitch! 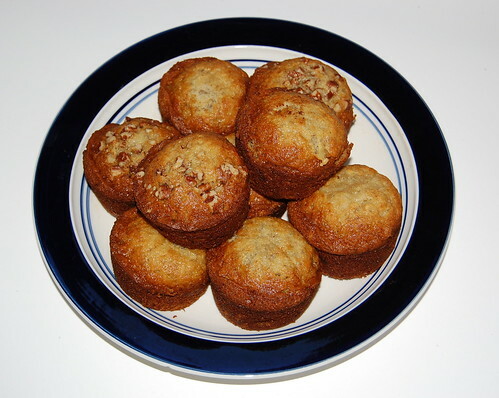 I love banana nut muffins:) Thanks for sharing the recipe. Just 3 of us here (TX) for turkey dinner tomorrow. Our family is so spread out, but mostly in N.C.
L*K is coming along nicely. Happy Thanksgiving to you and your family. oh, wow, yes! those colors are beautiful!!! plus the little security code for this post is 'motfin' which I find hilarious. Happy Thanksgiving to you! 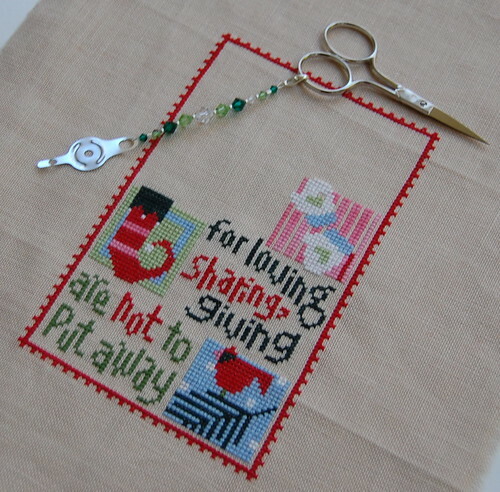 Love the colors in that piece - what a fun stitch it must be!!! L*K is looking great - lovely bright colours! Today's blog look is lovely! Hi Nicole. I've just found your blog and I've been having a quick look although I'll take my time for a more in depth look. You have very nice stuff; I'll come back, sure. By the way, thanks a lot for the recipe. I *love* your new Christmas template, Nicole - it's so festive! You're making great progress on your LK piece!